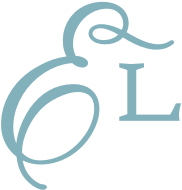 Designs can be downloaded immediately after ordering. These instructions demonstrate how to download with Chrome. Begin by checking the settings in Chrome. Open Chrome and look for the icon with the three dots on the upper right. It's circled in red on the image below. Click on those three dots, then click on "Settings." Scroll to the bottom of that page and click on the link that says "Advanced." In the "Downloads" section, click on the slider to the right of the text that says "Ask where to save each file before downloading." With that turned on, you can control where to save the designs when downloading. Next, click the Order History tab. 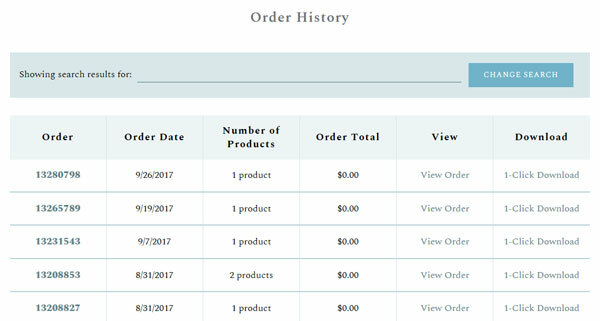 Click on the order number, or click the View Order link. Look for the column labeled "Download." Most designs will have two links -- one labeled unzipped, and another labeled zipped. 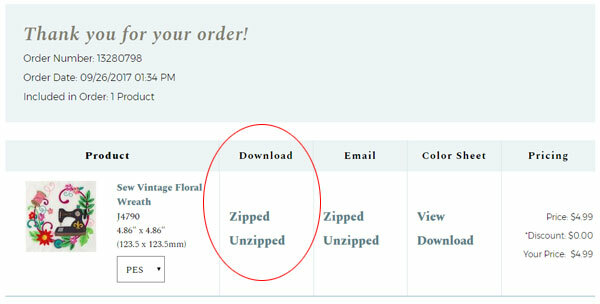 Click on either "unzipped" or "zipped" -- whichever you choose. Chrome will ask if you want to open or save the file. Choose "Save." 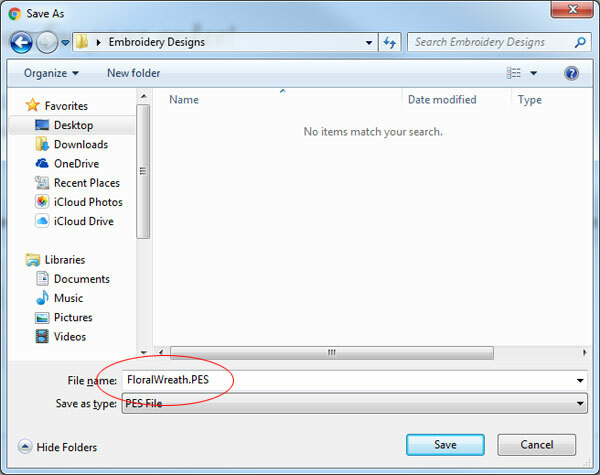 Click "OK."
In the example below, you can see that the design is being saved to a folder called Embroidery Designs. You can also save the design to a USB drive at this step. Keep the name that we've given the design, or rename it if you wish. If you rename the file, be sure to keep the file's extension intact. If you change it or remove it, the file will be corrupted. 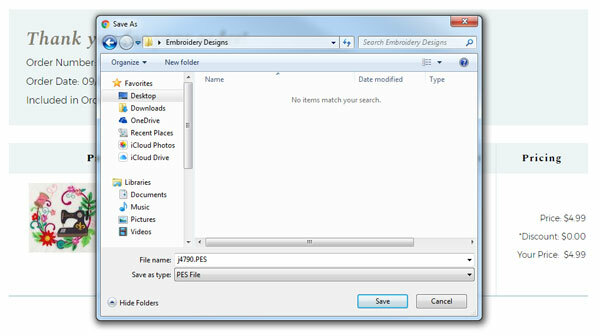 In this example, the file extension is .pes. The name has been changed to FloralWreath.pes. Then, click 'Save.' The design is now saved in the area that you selected. 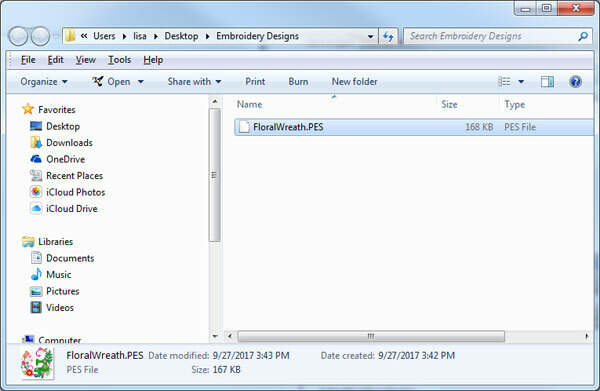 After downloading, you can upload the design to your machine or open it with embroidery software if you have software on your computer. Sometimes Chrome will tell your computer to open designs, rather than ask you where to save them. If this happens, clear the "auto open" settings in Chrome. To do this, click the three dots on the top right of the Chrome browser. Select "Settings." Then, select "Advanced." Under "Downloads," look for the sentence that reads "You have chosen to open certain file types automatically after downloading." 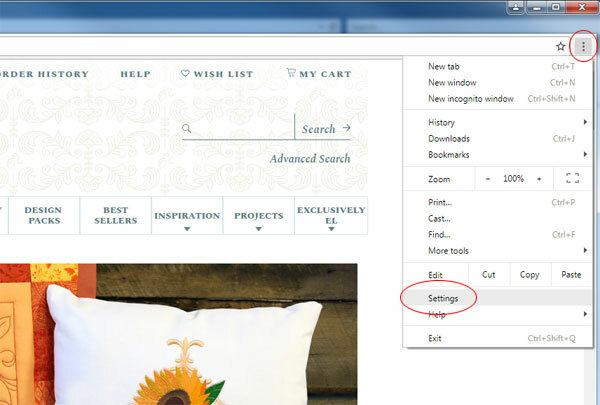 Click the "clear auto-opening settings" button so that Chrome does not tell your computer to open embroidery files automatically.